Wholesale Hotel Rates vs. Public Hotel Rates | How do they Compare? Wholesale Hotels Group - Wholesale hotel rates at their lowest! There are various types of rates in the hospitality industry and as you may have guessed this article is supposed to demonstrate the power of wholesale hotel rates. One is the rack rate, which is the published rates and those rates rarely anybody ever pays. Every property publishes its tariffs for a year or an unspecified period of time for different rooms. These are the public hotel rates that would be applicable if you walk into the hotel and reserve a room. You will pay the public hotel rates if you book a room directly through the website of the hotel. The public hotel rates are applicable to any and sundry till such time the property revises the same. Lower than the public hotel rates are discounted tariffs. This is what you are likely to get if you have an entourage and need several rooms or you want a special package from a chosen hotel. If you are staying longer, if you go for meals and accommodation, if you need special services such as conference facilities or perhaps a banquet and the venue for a special event such as weddings, receptions or business events, if you have some vouchers or rewards then you can get a handsome discount. This discount may be made available by the hotel, a travel agent or an online travel company. There are many ways to get such discounts. You may also negotiate with a hotel manager or reservation executive at many properties. Both public hotel rates or rack rates and discounted tariffs are different from wholesale hotel rates. Wholesale hotel rates are what you get when you reserve rooms in bulk. A bulk is not just one or two rooms for a certain period of time. Bulk is a substantial chunk of rooms available in the hotel as per their capacity. Every hotel will want to keep some rooms available for walk-in guests unless they are booked to capacity. Every hotel will want to facilitate some direct bookings and hence the rooms made available for online reservation may be fewer than the capacity. Wholesale hotel rates do not have to factor in such variables. When bulk bookings are confirmed by wholesalers, usually from time to time, they could be only a few or all the rooms available at a property. This paves the way for wholesale hotel rates that are significantly lower than public hotel rates or rack rates and ordinarily discounted tariffs that you would find on travel websites. If you have to choose, you must always go for wholesale hotel rates and not the usually discounted tariffs. It is all about the access, but do you have it? Your Travel Agency needs access to wholesale hotel rates and Wholesale Hotels Group provides just that to you, your company or your travel agency. It is one of the best hotel bedbanks that allows you to access both the pricing and inventory for wholesale rates and with one meta-search you can access the entire inventory of the most prominent wholesale suppliers with one simple search. The enrollment for Travel Agencies and Travel Agents is 100% FREE! Come and join us! 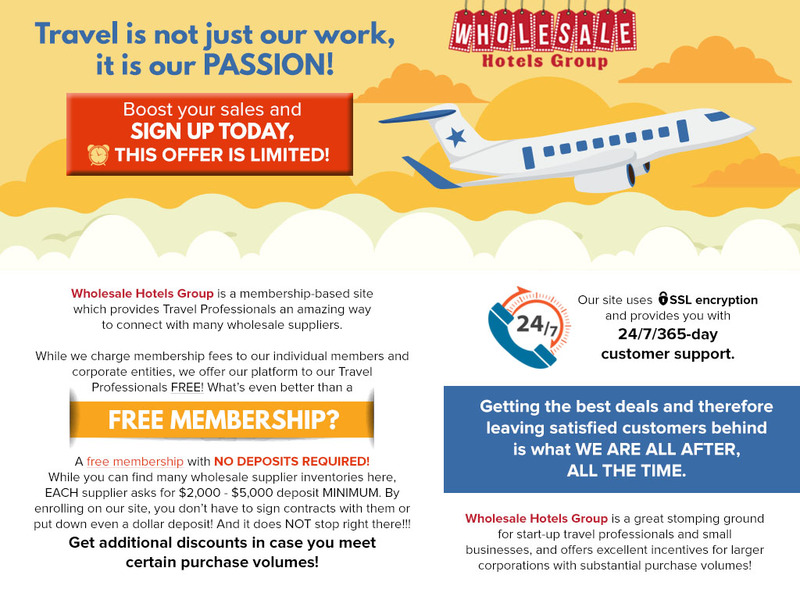 Wholesale Hotels Group – Wholesale hotel rates at their lowest!